In a pot, soak the knuckle bones in about a quart of water with 1 tablespoon of salt overnight. The next day, rinse the bones and place them with the oxtail bones in a pot and cover with water. Bring to a boil and cook for 5 minutes. Drain the water. Rinse the bones under running tap water and set aside. This step is important to get a clear broth before starting the long slow-cooking. In a giant spice strainer (see tips below), combine the cinnamon, star anise, cloves and both kinds of cardamom. Set aside. Char the onion and ginger: Wash the whole unpeeled ginger; pat dry. Peel the whole onion without cutting the stem to make sure the onion doesn't fall apart in the broth. Place a grill on your stove, then char all the skin of the ginger and onion. Wrap them in aluminum foil. Let cool for about 10 minutes. Wash the ginger and onion under running tap water; the blackened skin will come right off. Bruise the ginger using a hammer to loosen the flesh and help release all its flavor. Fill a 12-quart stockpot with 6 1/2 quarts of water. Place the oxtail bones from before, whole daikon, the strainer of spices and the charred ginger and onion in the pot. Bring the liquid to a boil. Then lower the heat to a bubbly simmer. Cook for about 2 hours. Regularly skim the impurities rising to the surface of the broth using a fine mesh strainer. Add salt, mushroom powder, sugar and MSG if you choose to. Cook for another 30-45 minutes. Fish out the oxtails bones using a slotted spoon, transfer to a big bowl. Cover with cold water and set aside for about 15 minutes. (Note: The method used to ensure that the meat does not darken as the broth cools down is basically the same procedure as that used to keep vegetables a bright green color). Drain the water from the oxtail bones, then refrigerate until it's time to serve. If you're health conscious, you can remove the fat from the broth: Let the broth cool down to room temperature, plastic wrap the pot tightly and place the whole pot in the refrigerator. The fat from the broth may pick up some other odors from the refrigerator if the container is not sealed properly. A layer of fat will form at the surface, which can be removed using a spoon. You can skip this step by regularly degreasing as the broth cooks using a fine mesh strainer. At the end, add the bones with marrow into the beef broth and cook for another 15 minutes. Soak the dry rice noodles in a big bowl filled with cold water for 45 minutes. Drain the water using a colander. Set aside until the beef broth is ready. When you're ready to serve, fill a medium-sized pan with about 2 quarts of water. Bring to a boil. Then place deep size bouillon strainer (or a large strainer that can fit in the pan) and add about 1 cup of the rice noodles. Wait for the water to come back to a boil (about 1-2 minutes) then cook for about 30-45 more seconds. Lift the strainer, drain the liquid and transfer the noodles to a serving bowl. Repeat for each individual bowl. You can ask your butcher to thinly slice it for you. My local Asian store provides this service. Just mention you need flank steak for phở bò. Your other option is to place the whole piece of meat in the freezer for about 30 minutes. Then thinly slice the meat using a sharp chef's knife. Make sure to cut the meat perpendicular to the grain so that the slices remain tender. I like to make the bowls of pho individually. Pour about 2 ladles of beef broth into a small saucepan. Add one oxtail and one knuckle bone. Bring the broth to a boil. Then add about 2 tablespoons of the sliced raw flank steak. As soon as the beef slices are in the broth, transfer immediately to your serving bowl so that the meat keeps a slightly pink color and remains tender. Repeat for each individual bowl. Be organized. Line up the serving bowls. 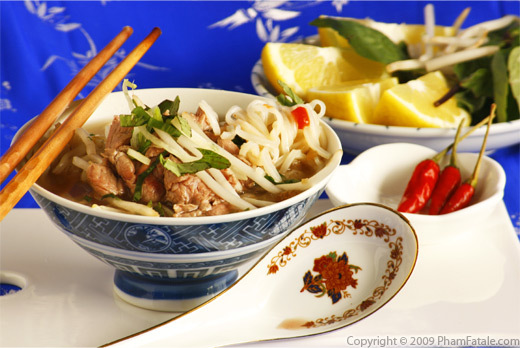 Place a little chopped white onion, some green onions, bean sprouts and cilantro in each bowl. Add the boiled drained rice noodles. Add the slightly cooked slices of beef along with the boiling broth you have prepared. Serve with chili garlic sauce and hoisin sauce, Thai basil, mint, jalapeno peppers and the bird chiles. Squeeze some lime juice into the beef broth to finish. I prefer using the dry banh pho rice noodles. I buy the Ba Co Gai (Three Ladies) brand for this dish. I always pick the small-sized flat rice noodles. You can also use the medium-sized ones. I think this is the best brand of dry rice noodle on the market; you can find it in Asian stores. The key to a good pho is a good, clear, fragrant broth. 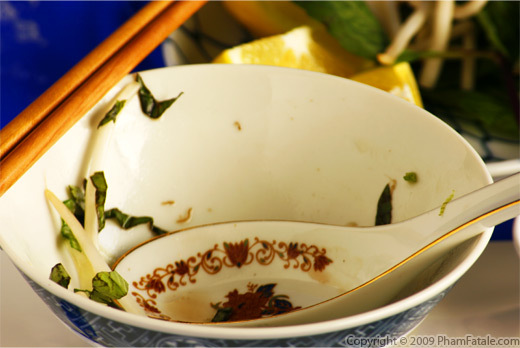 If, at the end of the meal, you see empty bowls and no beef broth left, it means that you successfully made an excellent pho. Cooking very slowly and gently keeps the broth relatively clear. It's very important to get rid of the scummy foam that rises to the surface of the broth as it cooks. Never bring the broth to a full boil, always keep a gentle simmer. Also to ensure a clear broth, if the broth is too salty, only add boiling water, NO cold water. I usually have a kettle of boiling water on the side. I purposely do not salt the broth at the beginning, but wait to add salt until the bones are fully cooked. This way the broth remains clear. If you do not own a giant spice strainer for the pho spices, you can use a cheesecloth. Place all the spices in the cloth and tie it in a tight knot. Mushroom seasoning salt brings a very distinct, earthy flavor to the sauce. 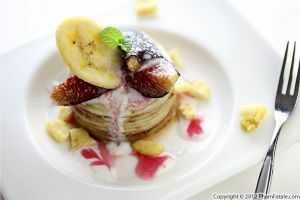 You can get it at any gourmet specialty store or in most Korean stores. I get mine at Marina Foods, 10122 Bandley Drive, Cupertino, CA 95014. They also have a great food-court. I love their Chinese duck. Daikon (củ cải trắng in Vietnamese) is an Asian turnip that looks like a large white carrot. I use this root a lot for making broth. Discard the root when the broth is ready. It's also delicious when it's pickled with carrots and is commonly used in Vietnamese bánh mì sandwiches. 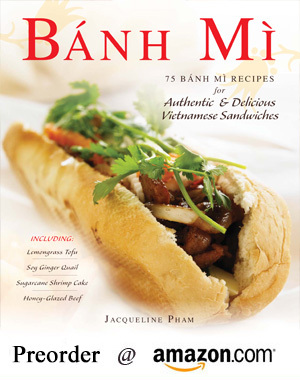 They are yummy Vietnamese baguette sandwiches stuffed with pickled daikons and carrots, tofu or grilled meat and green sliced chiles. Technically, I do not use flank steak but the outside flank of the steak (the best part), called nạm. Placing the meat in the freezer helps you control the thickness of each slice of meat. Make sure the slices are as thin as you can make them. Also make sure the meat is sliced against the grain to ensure optimum tenderness. When you're ready to serve, you can drizzle in some fish sauce (nước mắm in Vietnamese) but I personally am not a big fan. I like fish sauce, but I don't think it's a good complement to this dish. It's great with seafood however, like pan fried catfish. Vietnamese mint has a very different flavor than regular mint. It also has darker vein markings on the leaves. 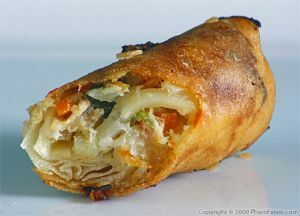 It's commonly used in Asian salad like Vietnamese chicken salad and also springrolls (gỏi cuốn in Vietnamese). Check out my recipe for chili garlic sauce, tướng ớt in Vietnamese. It's ultra easy, all you need is super fiery, spicy, deep red chiles. I am not a big fan of MSG (monosodium glutamate), Aunt Danielle likes to add it to her broth, but I don't. If you have pho beef broth left over, place the broth in containers and store in the freezer. You can keep this up to 6 months. Making pho is time-consuming. I always make this dish on the weekends. I make a huge batch and invite all the carnivores I know. This is one case where your patience will definitely be rewarded. 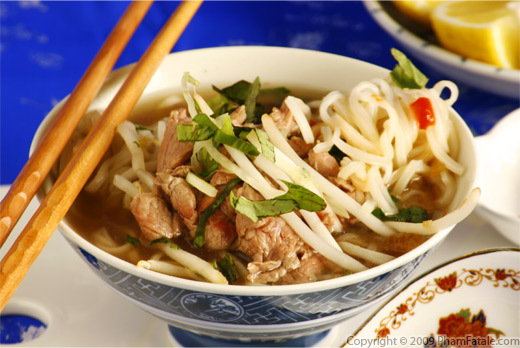 Savor your steaming bowl of pho! UPDATE: To produce a truly authentic pho, you can substitute an equal amount by weight of Asian rock sugar for the sugar in the recipe. Check out the vegetarian version with my phở chay. Published By: Jacqueline Pham on March 23, 2009. Although I'd rather go to a Pho house and buy a bowl for 5 bucks than follow this recipe. Although if you could just go to an asian market and get good premade broth, I think I could handle doing the rest. I don't know if I've ever looked for cans or jars of the broth. the result of a homemade broth is so worth it, if you can bare the effort. That's why I make sure there is enough people to share pho with before making it. 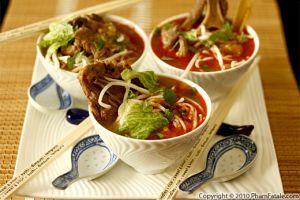 I've been looking for a good pho recipe that doesn't involve the pre-made cubes. Love to cook from scratch when I have the time. If you don't live in a place where pho is plentiful, I'm sad for you. Just another reason why multicultural toronto is a great place to live! you put it into boiling water...then not so much. it cooks in the beef broth. it's raw steak that you dip in hot boiling broth. Technically, it's not raw anymore. It's just that the name in Vietnamese "tai" translate to raw in English. In Vietnam, it's like eating eggs, sausage and bacon for breakfast. After a few minutes, it'll be colored just like any other cooked meat. "bef soop" like they do in my favorite restaurant. get zone 1 rail card get off at footscray (or if you live next door to my parents, meander up paisley street) go to one of 15 pho houses off hopkins street order pho eat pho go home happy, stopping off at olympic doughnuts for desserts. I also add a few cloves into the onion before I char it. Instead of sugar, the traditional recipe calls for Asian rock sugar. You can find this at most Asian markets. You're right you can add the same amount by weight of rock sugar for 6 1/2 quart of water. Thanks for pointing that out. Unfortunately, I don't think I can rustle up enough people (or have enough room to store) this much broth. 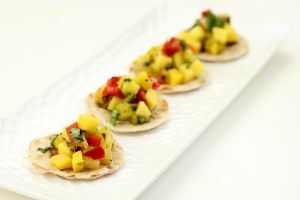 Can I make a 1/2 recipe by halving the ingredients or would that throw the flavors off? Otherwise, I'd love to give it a try! I guess you could divide the quantity by 2 but put maybe 3/4 of the amount of beef bones and bone marrow. That's what will make the broth stand out more, compared to the one served at the restaurant pho house. To cut on the cost, restaurants usually put less beef bones and add a bunch of MSG (glutamate) as a flavor enhancer. Once you try it though, I think you'll want to make a full batch and store it for whenever you need a pho fix. Good luck and let me know how it turns out! Jackie, when you say oxtail bones, do you mean I need to take the meat off or do you mean the pieces in packages that I can buy at the Asian market? I get oxtail bones from the Asian supermarket. It's usually sold in packs of 6. Just find the butcher and ask for his help if you can't find them. 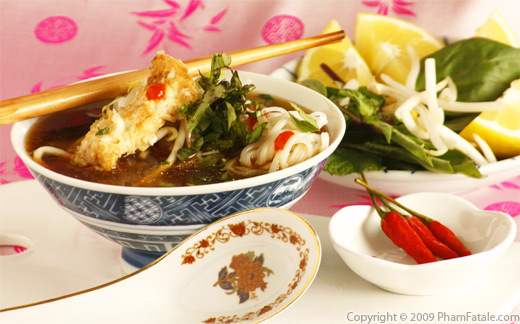 Mention that you want to make some pho. Jackie, I have been looking for a site like this for so long. GIRL YOU ARE THE BOMB !!!!!! I LOVE THIS SITE AND WILL FORWARD THIS TO ALL I KNOW WHO I TALK TOO WHO ALSO SAY WE ALWAYS WISH WE COULD FIND A SITE !! I love this soup. I was introduced to it almost 6 yrs ago, but only last week did my wonderful friend Han/Amy teach me how to make it. I have made it 3 times within a week. I've told my other friends that I now know how to make it and they are all coming next weekend to eat the soup. I am a regular at the market now. My soup looks just like your soup picture. I'm glad that you enjoyed the pho. It may be time-consuming but it's definitely rewarding. I have grown up eating Pho as my best friend is Vietnamese. Her mom owned a restaurant but never would share recipe, just "show you"! I'm really excited to try this! I will let you know how it turns out. My 14 year old's favorite food... not pizza, not McDonnalds... it's Pho.. so today we hit the asian grocer and start to cook! Wish us luck! A pain to make but it is the best hangover food ever. Make and freeze 1 cup per morning after and life is good. If I skip the MSG, would the flavor be blah? I don't know of anyone that cooks from scratch or not use MSG and afraid to try. At this point do I also add the knuckle bones back in?? "Fill a 12-quart stockpot with 6 1/2 quarts of water. 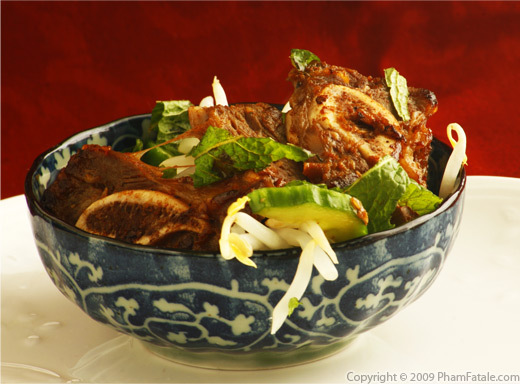 Place the oxtail bones from before, whole daikon, the strainer of spices and the charred ginger and onion in the pot." How many oz. is each serving? Thank you!